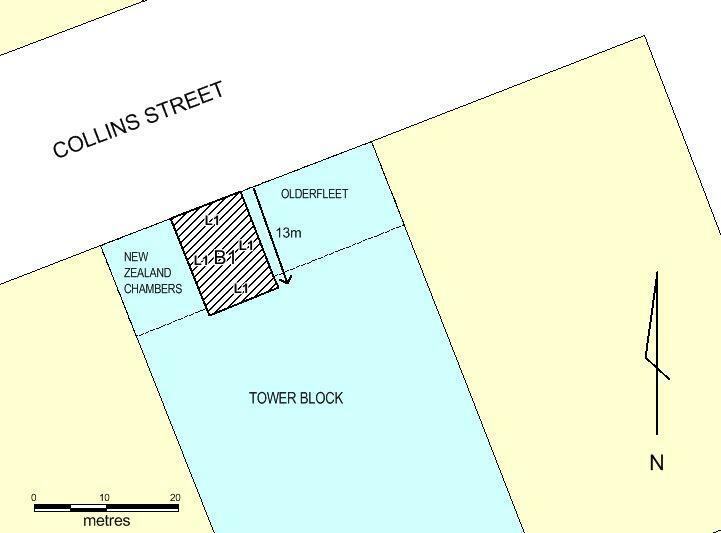 The retained front section of the Record Chambers building comprising the facade to Collins Street, and returning to a depth of approximately 12 metres and including the iron gate which gave access to the laneway leading to the rear. The printing and publishing firm of McCarron, Bird & Co. was established in 1872 in Flinders Lane west. Among their early publications was the Australasian Insurance and Banking Record, founded in 1876. The Record, which later gave its name to the Record Chambers building, was pre-eminent amongst insurance and banking journals in Australia. Other publications by the company included Alexander Sutherland's Victoria and Its Metropolis (1888), and numerous journals, including Australasian Trade Review, Manufacturer's Journal, Australian Brewers' Journal, and Temperance News. 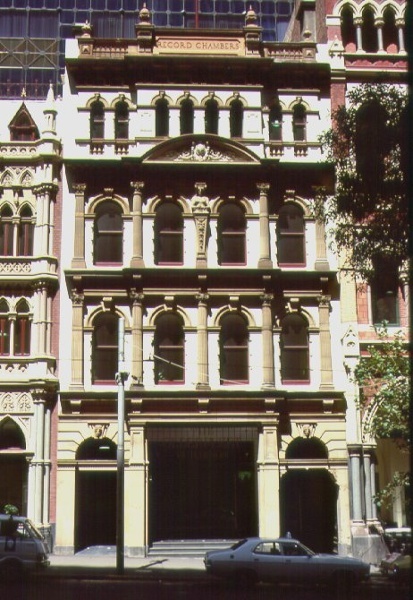 In 1887 the partnership moved to their own purpose built premises, the Record Chambers building, designed by J A B Koch and built by G B Leith of Flemington. Koch was from Germany and many of his designs betray German Baroque roots. The new premises were constructed during the building boom of the 1880s, which transformed this part of the city from one of small warehouses in close proximity to the wharves, to one of commercial and mercantile activity. The printing works incorporated lithography, engraving and bookbinding. The ground floor served as a retail stationary shop. The Record Chambers was threatened with demolition in the late 1960s, but as a consequence of heritage legislation, the front part of the building was retained in the 1984 redevelopment. 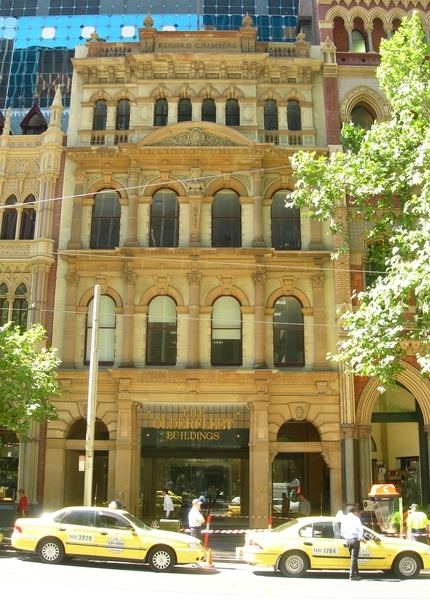 The Collins Street facade of the Record Chambers building retains the original ground floor arrangement of two entrances (one pedestrian, one vehicular) flanking a large shop window, although the window has been replaced by an entrance lobby. The iron gate, which gave access to the laneway leading to the rear, is now fixed in an open position. The facade, which is the most significant part of the building, is an expression of free classicism. It is arranged as four bays, the central two projecting slightly towards the street. Engaged columns and pilasters define each bay. A caryatid terminus (half-female figure on a pedestal) takes the place of the central column on the second storey. The four large arched windows to the first and second storeys contrast to the eight smaller windows on the third storey. A prominent cornice and a segmental pediment crown the second storey. The top of the building is decorated with a bracketed cornice, with balustraded parapet and four urns. The words 'Record Chambers' are inscribed in the centre balustrade. Internally the building has a depth of approximately eleven metres, which is all that survives following redevelopment at the rear. Exposed timber roof trusses and a tongue and grooved lining board ceiling survive in the top floor, though the ceiling linings are concealed behind modern finishes. The Record Chambers building is of architectural and historical significance to the State of Victoria. Record Chambers, 479-481 Collins Street, Melbourne, Melbourne City Council. 1. All the buildings and structures being B1 Record Chambers building as marked on diagram 38 held by the Executive Director. 2. All the land marked L1 on Diagram 38 held by the Executive Director, being described in part of plan CP159396L Vol. 10184, Fol, 749 being part of Crown Allotments 12 and 13, Section 2 in the Parish of Melbourne North. G B Leith. Leith was based in Flemington. He came to Victoria in 1881 and worked as a stonemason for 12 months before becoming a building contractor. His other major project was the Stock Exchange for architect William Pitt (G Sutherland, Victoria and Its Metropolis, Vol II B, p 645). Distinctive style and a master of the decorative use of cement render. Eg. Labassa (formerly Ontario) in Caulfield, 1889-91; Friesa (formerly Oxford, Isabella Grove, Hawthorn (1888); Ulimaroa, St Kilda Road(1880). The printing and publishing firm of McCarron , Bird & Co. was established in 1872 in Flinders Lane west. The partnership comprised JF McCarron, JH Bird, HW Puttman and Andrew Stewart. The partnership published the International Exhibition catalogue, 1875. and then in 1876 founded the Australasian Insurance and Banking Record. The Record, which later gave its name to the Record Chambers building, was pre-eminent amongst insurance and banking journals in Australia. Other publications by the company included Alexander Sutherland’s Victoria and Its Metropolis (1888), and numerous journals, including Australasian Trade Review and Manufacturer’s Journal, Australian Brewers’ Journal and Temperance News (Victoria and Its Metropolis, Vol.2, A Sutherland, 1888, p.569). In 1887 the partnership moved to their own purpose built premises, designed by J A B Koch and built by G B Leith of Flemington. The MCC building permit, no.2542, is dated 19 November 1886 (Burchett Index). Presumably the building was finished in the first half of 1887. The building, with fireproof floors, cost over £18,000 (Builders and Contractors News 15 October 1887 p 366). Despite being recently completed, by the late 1880s the building was barely adequate for the burgeoning business. The printing works incorporated lithography, engraving and bookbinding (Victoria and Its Metropolis, Vol.2, A Sutherland, 1888, p.569). The ground floor served as a retail stationary shop. The first and second floors were divided into offices for tenants. A 7 ft (2.1m) well hole was left in the building for the later erection of a passenger lift. An Otis goods elevator was installed during construction and served the printing works (Builders and Contractors News 15 October 1887 p 366). * Refurbishment of the entrance lobby. hanging of mirrors, paintings and other wall mounted artworks. stoves, ovens, refrigerators, dishwashers etc and associated plumbing and wiring. conduits then the conduits should remain in-situ. The purpose of the permit exemptions is to allow works that do not impact on the significance of the place to take place without the need for a permit. The primary significance of the Record Chambers Building is the facade. The interior spaces have lower degrees of integrity. Exemptions are designed to allow non-structural refurbishment of interior spaces. The 1980s lobby is not considered significant and changes to this area that do not impact on the outward appearance of the building are exempt from permits.